The Australian Currency is the Australian Dollar - AUD or A$ - and if you'd like to know how much your money is worth as Australian money, you can use this handy Currency Converter. The Australian currency is a decimal currency, there are 100 cents to one dollar. Five, 10, 20 and 50 cent silver coins are available, and one and two dollar gold coins. Silver and gold is the colour of the coins, not the material. They are made from cupro-nickel (silver) and aluminium-bronze (gold), respectively. Depicted on coins of Australian currency you can find several popular Australian animals: kangaroos (one dollar), the platypus (20 cents), the lyrebird (10 cents) and the echidna or spiny ant-eater (5 cents). The one and two cent coins of the Australian currency disappeared after 1992, but the shop prices remained a typical "something and 99 cents". When you pay for your items the sum of your purchases will be rounded to the nearest five cents. Unless of course you pay by card. In that case you will be billed the exact amount. The bank notes are colourful and made from some sort of plastic (a polymer). They are difficult to counterfeit, very durable, and don't crease much. They also have the bad habit of unfolding themselves and that way can jump out of your purse or pocket. True. The denominations of the Australian currency bank notes are five (purple), 10 (blue), 20 (red), 50 (khaki) and 100 (green) dollars. ATMs usually dispense 20 and 50 dollar notes. 100 dollar notes are not very common for some reason. 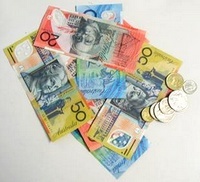 All notes of the Australian currency show pictures of personalities important to Australia's history. I want to point out another option, interesting for people who want to spend a few months or more in Australia, especially people on a working holiday. Also check with your local bank at home if they have linked/partnered with any Australian bank. Some do and provide the possibility to continue using your regular account, withdrawing your funds as Australian currency while here. Since this is a first world country expect to pay first world prices! To help you get an idea what your accomodation/car hire/tour etc. will cost you I have added a currency converter below. The currency converter uses live, up to date rates. Of course you can perform the conversion the other way. Select your currency in the first box, and the Australian currency in the second.